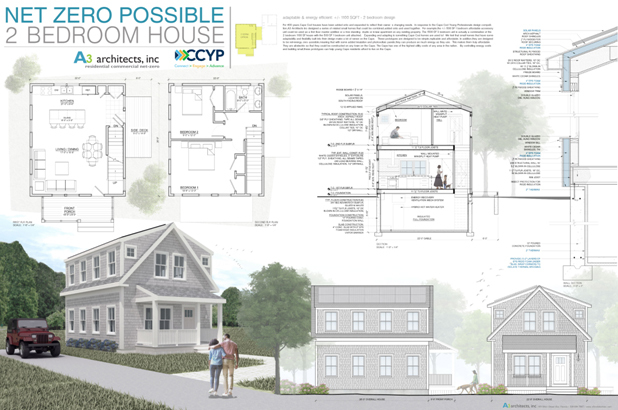 We were thrilled that the local non-profit Cape Cod Young Professionals announced a design competition for affordable housing on Cape Cod this summer. Affordable housing continues to be a major issue for all who live on the Cape. We have had the privilege of working with the Community Development Partnership to develop 12 units of affordable housing for Harwich several years ago, but we were excited to focus on the issue again for the competition. We submitted 3 designs – a 500 SF affordable unit, an 1100 SF 2-bedroom unit and a 1600 SF 3 bedroom unit which were all named finalists. The designs are all quite traditional and compact, again to address affordability. We are committed to low energy use homes, so all three were designed to be net-zero possible with the addition of photovoltaic panels. While affordable housing is an issue on the Cape so are energy prices. Fixing energy costs goes a long way towards addressing affordability. The finalists will be displayed at the CCYP’s annual back to business bash in Hyannis this evening. We are so excited to develop these schematics and hope it helps move the conversation forward on the need for affordable housing on Cape Cod.